Maccaferri India attended the 6th Coal Summit & Expo 2016 in New Delhi, offering an array of case studies relevant to queries in the mining sector. The primary objective of conference has been to provide a platform to bring together high-level delegations from all over India and other countries for exchanging information and ideas as well as presenting new developments on the theme. Challenges in the Coal Sector are many, and so are the obstacles which are varied in nature. The objective of the Summit was to identify such problems and discuss preemptive measures and solutions. The Expo provided an excellent business opportunity for coal mining and allied industries to showcase their new initiatives, technologies, products and services to the global audience. Maccaferri showcased its case studies in different areas of the Mining sector, especially the 120m high Overburden dump Stabilization with Flexible gabion retaining walls and Mulching on slopes, and Flexible Reinforced soil walls. One such case study was the Northern Coal Fields, Singrauli project. The fields are located in India. The area comprises some open cast mines which produce large quantities of waste through its mining activities year after year. Continuous deposition of residues results in the creation of the major unstable dumps. During monsoon season, the unstable slope along the roads to the mines subsidies, causing poor access to mines and thus affecting the mining activities. The height of dump ranged from 30m-100m with slope angles of about 400-600. The dump material was comprised of loose earth, and it displaced a cohesion of about 20 kN/m3 and friction angle=380. 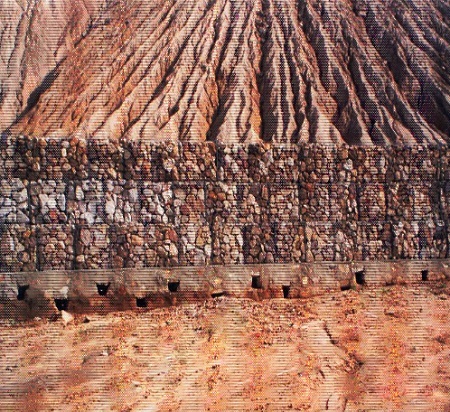 Maccaferri came up with the following solution to mitigate the query at the Northern Coal Fields. The slope was divided into fragments with berms in between. Gabion toe walls were placed at the toe of each slope piece, and mulching (to promote vegetation) was fixed. A nonwoven geotextile was provided as filter and separator behind Gabion walls. Additional French Drains at c/c spacing of about 3-5 m were proposed across the slope to ensure drainage and thus prevent erosion. A mulching and natural jute blanket were installed onto the slope to avoid local erosion. Simplicity in construction: execution of stabilization work using Gabion technology was simple. Environmental Friendliness: the solution not only proposed to stabilize dumps but also to establish vegetation along the slope. For more technical information, please download our Case Study. For further information about our projects, please contact us.